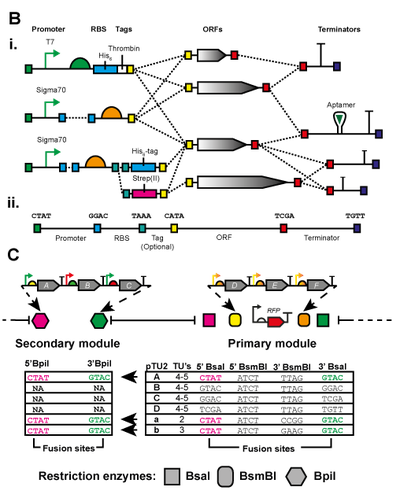 The EcoFlex Toolkit is a collection of plasmids that features a library of constitutive promoters, T7 expression, RBS strength variants, synthetic terminators, protein purification tags and fluorescence proteins for use in E. coli for a variety of applications. 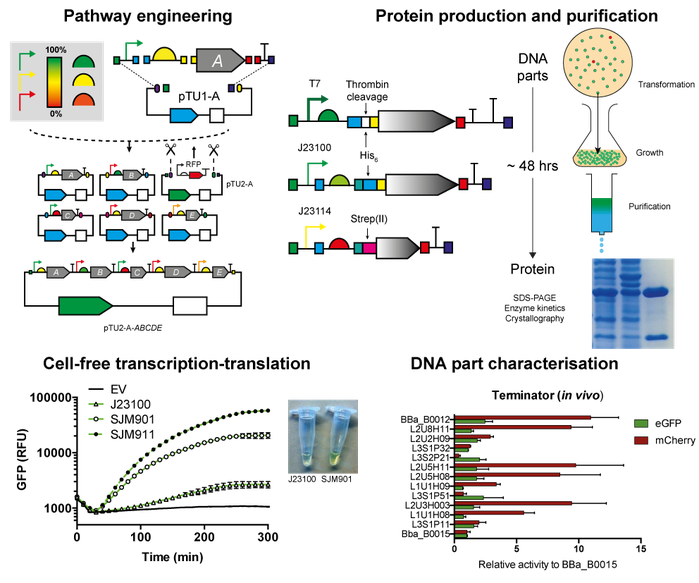 EcoFlex: A Multifunctional MoClo Kit for E. coli Synthetic Biology. Moore SJ, Lai HE, Kelwick R, Chee SM, Bell D, Polizzi KM, Freemont PS. ACS Synth Biol. 2016 May 2. [Epub ahead of print] PubMed PMID: 27096716 . EcoFlex is a Golden Gate kit for E. coli synthetic biology. The kit consists of a modular library that uses the MoClo assembly standard for use in a variety of applications, like recombinant protein purification and cell-free circuit design. EcoFlex assembly. (A) Level 0 parts are held in pBP (bioparts–promoters, RBS, tags and terminators) and pBP-ORF (open reading frames) plasmids and assembled with BsaI and T4 DNA ligase into pTU1 destination plasmids (A, -B, -C, -D or -D1, -E) forming Level 1 TUs. Genes are cloned with NdeI (5′) and BamHI (3′), with the NdeI site providing an overlap between the start codon and RBS fusion site (CATA). Alternatively, if these sites are located within the gene, custom designed BsaI primers are used. Level 2 modules (2–5 TUs) were assembled with BsmBI and T4 DNA ligase into pTU2 plasmids, which were modified to provide flexibility for assembling 3–5 TUs into a module. In addition, Level 3 pathways (up to 20 TUs) can be assembled from compatible Level 2 modules into pTU3-A or pTU3-B using BsaI and T4 DNA ligase. 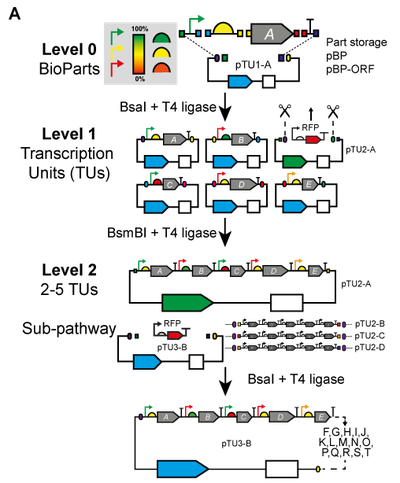 (B) Assembly options (i) for purification tags and promoter choice, (ii) fusion site sequences and positions for Level 1 assembly of TUs. (C) Secondary module cloning for optimizing library screening and minimizing pathway variation. Table details compatible fusion sites and assembly options. Figure 1 from Moore et al, 2016. PubMed PMID: 27096716 . Courtesy of ACS Synthetic Biology. Graphical abstract from Moore et al, 2016. PubMed PMID: 27096716 . Courtesy of ACS Synthetic Biology.